Jerry Jones is a self-made American businessman, popularly known as the owner of NFL’s Dallas Cowboys which is the most valuable sports team in the world with the value of $4.2 billion. One of the most significant men in the NFL, Jones has been able to turn around the fortunes of the Dallas Cowboys by helping it become stronger than it ever was for a very long time. Jerry Jones was born on October 13, 1942, in Inglewood, Los Angeles California. He was raised in North Little Rock Arkansas where he attended high school. Jones is among the very few NFL team owners today who have had a history of playing football. He started right from high school where he played as a running back and continued through to college at the University of Arkansas as co-captain. His team won the 1964 National Championships. Jerry graduated from college in 1965 and immediately got a $1 million loan from Jimmy Hoffa’s Teamsters. The loan was used to start up a chain of Shakey’s Pizza Parlor restaurants in Missouri which later turned out a failure. He then began working as the executive vice president of Modern Security Life of Springfield, Missouri an insurance company owned by his father. It was during his freshman year at the University of Arkansas that Jerry met an extremely beautiful woman, who was 1960’s Miss Arkansas USA. The woman was Eugenia “Gene” Chambers, and before they left college, the two had become man and wife. That was in 1963, and over 50 years down the line, they have only gotten closer thanks to how much tolerant his wife is. Following their long years of marriage, the two have three children, Stephen, Charlotte, and Jerry Jr. The three of them have over seven children, making Jerry Jones and his wife grandparents. The entire members of his family, including his wife and children, are all members of his business, playing important roles. Jerry attempted to set up several other business ventures but all failed. His first successful business venture was Jones Oil and Land Lease, an oil and gas exploration business in Arkansas. In 1970, he got a masters degree in business. Now a millionaire thanks to his oil exploration business, Jerry in 1989 bought NFL team Dallas Cowboys from H.R. “Bum” Bright for the price of $140 million. 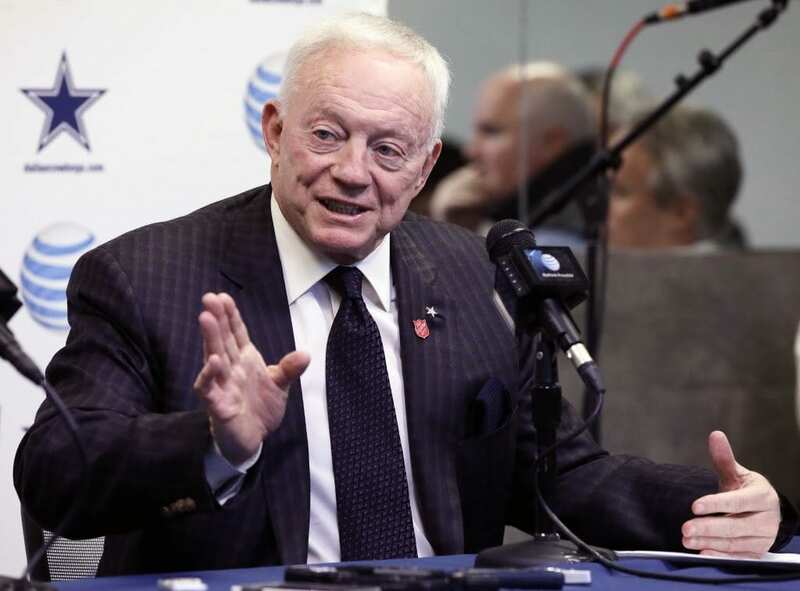 As the new owner of the Cowboys, Jerry’s actions to restructure the team sparked criticism from fans. First was when he sacked the team’s only coach in its history Tom Landry replacing him with his old-time teammate Jimmy Johnson. Soon after, he sacked Tex Schramm, the team’s longtime General manager and assumed his position, overseeing every football matter. The criticisms seemed to reduce when the Cowboys won two back to back Super Bowl victories in 1992 and 1993 under Jimmy Johnson. Following a friction between Johnson and Jerry as a result of varying opinions and decisions, Johnson resigned as Cowboys coach awakening the fans’ hatred for Jerry Jones. Jerry then hired University of Oklahoma head coach Barry Switzer who led the team to another Super Bowl victory in 1995. The criticisms have remained as the team’s performance since their last super bowl victory have been described as mediocre. In a poll conducted by Sports Illustrated in 2003, Jerry Jones was named the least favorite sports personality in Texas, Delaware, and Virginia. There have been numerous attempts to displace Jones from his position. However, regardless of their lack of major football successes, the value of the team has managed to grow exponentially to $4.2 billion making it the most valuable sports franchise in the world. This is thanks mainly to its AT&T stadium suites which rake in millions year after year. In 2014 the stadium made $120 million from premium seating revenue and $30 million from non-football events. The same year it was valued at $3.2 billion but that surged by 24% in a year to $4.2 billion. A large percentage of Jerry Jones wealth is from the team’s success. Personally, his net worth is pegged at $5.6 billion. An ardent art collector who owns a house in Destin, Florida, Jones has channeled much of his profits made from the Cowboys team into a lucrative real estate business. He owns several retail and residential real estate developments in Dallas suburbs.